Ha…I love that sentiment! 😉 To create this card I took a piece of white cardstock and stamped the foxes from Hey Foxy with a light pink dye ink. I used my MISTI to help me line up the foxes across the card. Next I stamped the fox with the tilted head with Memento tuxedo black ink and colored him with copic markers. I fussy cut him and then went over the edges with a black marker to give him a more finished look. I adhered him to the card panel with foam mounting tape and then stamped the sentiment on a die-cut speech bubble. I realized the sentiment wouldn’t really stand out on the white background so I cut a second speech bubble with pink cardstock and used it as an offset mat. I also adhered the sentiment with foam mounting tape. Finally I trimmed down the white cardstock and mounted it to a pink cardstock base. Thanks again for all of your support last week during our Fall 2015 release! We are so appreciative of your kind words and comments! Make sure to stop by tomorrow to see if you were a lucky winner of a stamp set of your choice and have a fantastic day! Really cute, Jess, love the foxy background! What a great card and that sentiment cracks me up! Haha…how sassy and fun! LOVE this, Jess! I am just loving this adorable little fox and what a great card to not only use it as a main image but to stamp the background with them as well. Thanks for sharing. Hope you have a blessed day. Really cute, Jess. Love the way you stamped the background too. That is so cute Jess! I love how you created the background, what an awesome idea. Great fun. 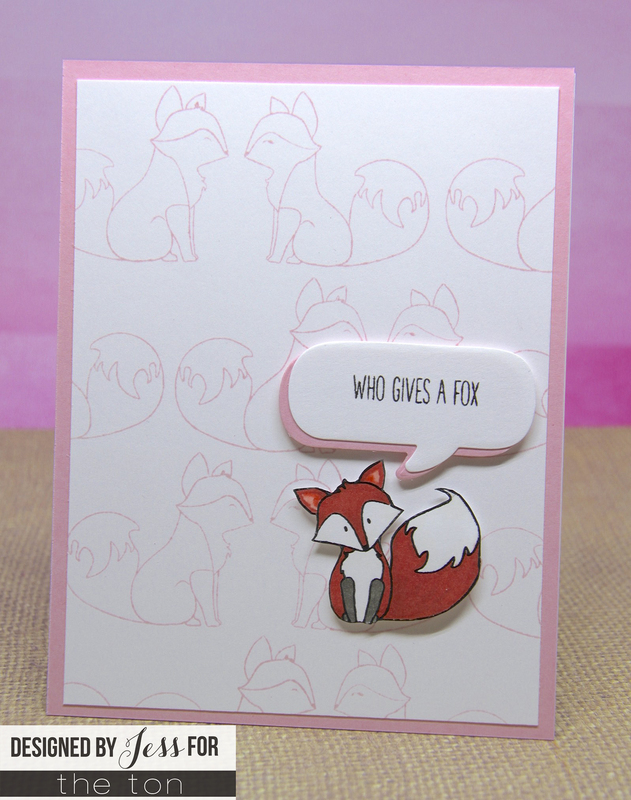 Like your stamped background and the fox is adorable even though he’s being a bit sassy, lol.